It’s a big day for regime change. The protests in Libya are expected to be huge today (remember, Friday was big in both the Egypt and Tunisian protests). And the Irish are going to the polls, where the Fianna Fail party is virtually certain to lose its grip on power. And markets are rallying! 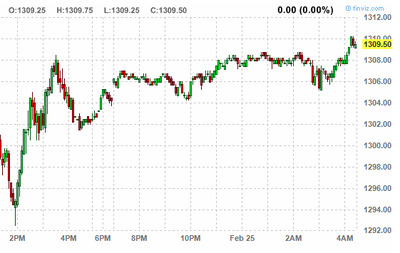 European markets are up across the board, and S&P futures are at their highs of the morning.